People have different purpose for watching videos, some of them watch videos for killing time, while others watching videos for training. Videos help you to grasp the information and knowledge in several fields in an engaging way. But at times, the videos people get are not compatible with their devices or video players. At this moment, people want to convert MP4 to MKV format or other formats for smooth playback on their devices. If you want to convert videos for your devices with high quality, then you must have a piece of good video converter software. In this article, we’re going to introduce you several helpful video converter solutions. KeepVid Video Converter is a full-featured solution for video conversion which is capable of converting videos in more than 1000 video/audio formats. If you are looking for the Mp4 to MKV converter, KeepVid Video Converter is regarded as the best option for you. With the help of this software, converting MP4 to MKV is as easy as falling off a log. This video convert can be used in two ways. You can download online videos and then convert them directly, or convert the local videos to other video and audio formats. Compatible with Windows and Mac devices. Convert MP4 to MKV and more than 1000 other formats. Download the videos from over 10,000 online video sharing sites. It enables you to edit videos before converting them with trimming, cropping and effects features. It is equipped with the lossless conversion technology that helps you to convert videos with original quality. Convert any video with 30x fasted speed when compared with other converters. Step 1. Start KeepVid Video Converter and add the MP4 video from your computer. Step 2. Choose MKV as an output format, and click the Convert button. Install KeepVid Video Converter on your computer or Mac from the official link and launch it. Select Convert section at the top middle of the main interface. Click Add Files/Add Folder at the upper left corner of the main interface, and add the MP4 video from your computer. The program will display the detailed information of the video. Click the inverted triangle at the right side of the Target area, or the inverted triangle beside the Convert all files to button, then select MKV as an output. After that, click the Convert button or Convert All button to start converting MP4 to MKV videos. 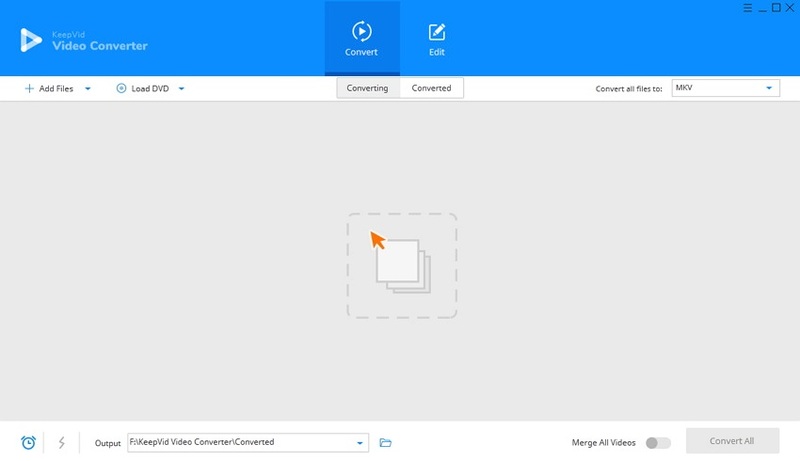 As mentioned, KeepVid Video Converter enables you to convert all kinds of video and audio files, so if you want to convert MKV to MP4, you can also get the work done with KeepVid Video Converter. • Save time with the batch conversion feature. You can select MKV as output format and convert all of them in one time. • Make use of the editing feature, and it can help you to get the video with more personalized customization. • This software enables you to customize the resolution of the video. In this part, we're going to introduce you the top MP4 to MKV online and desktop video converters. KeepVid online video converter is an online video converter service for you to convert your local videos with easy steps. Add the local videos and select MKV from the available output format option and click on convert now button. That’s it. With the help of KeepVid online video converter, you can convert your videos to more than 50 formats. This is the free Mp4 to MKV converter which is capable of converting HD videos into more than 300 formats including MKV format. It’s easy to use and handles blue clear interface. It is compatible with Windows 7 and 10. This video converter program allows you to convert videos HD videos to standard video quality for devices with small storage space. This MP4 to MKV converter is a free video convert program which can help you to convert MP4 to MKV easily. Besides converting videos to MKV format, this video converter also enables you to convert videos in many more formats. It has the feature to import the images and audios to make the videos and then convert the videos in the desired formats. Downloaded and recorded videos are also converted into MKV or any other format. After going through the features of KeepVid Video Converter and checking out the top three video converters, you can make a fair decision for what type of video converter you want to use. 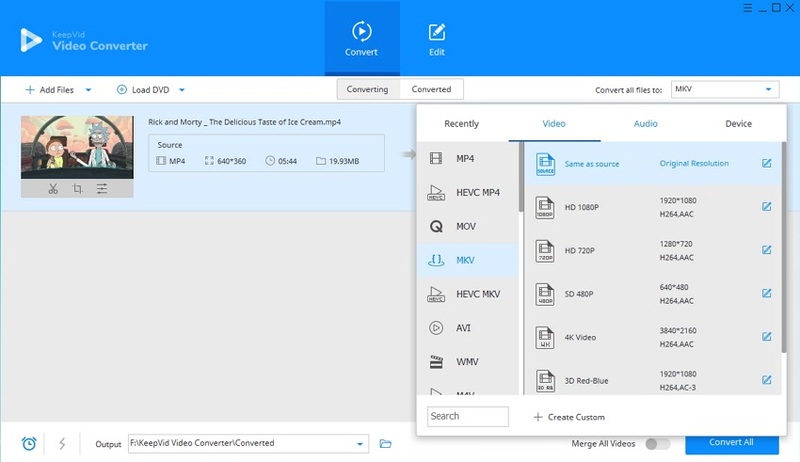 Users, who are looking for the easier and handier methods to convert MP4 to MKV videos, will take the KeepVid Video Converter software as the first choice.